The first time someone used a smartphone for clinical practice both shocked and appalled me. I was doing a night shift with an intern and a resident and it had been pretty quiet, so we were all relaxing in the doctor’s mess, waiting out the calm before the inevitable storm. The intern goes down to see the patient, but then ten minutes later my resident’s iPhone gave a quick beep and there it was. A picture of a heart tracing, an ECG, followed by a couple more. We take a good look. ”Good job catching that one! Follow protocol,” calls down our resident. Meanwhile, I’m thinking about how many, not yet existing, privacy breaches I’ve just seen? At the same time, in a large hospital, those digital pictures let us call the specialists, set up labs and start lifesaving treatments 10 – 15 minutes faster than we otherwise would have been able to. That event put me on the road to where I am today. The beauty of mobile technology is that, for the most part, we don’t need a lot of new infrastructure. Many doctors and hospital managers already carry smartphones with the requisite capabilities. Even tablets have been hurtling down in price for institutions. With all this excess capacity, it only makes sense that we should use it to re-energize and even replace clunky, legacy IT systems. We all know that we have shortages of healthcare professionals on site when we need them most. That experience can be the difference between life and death, delaying treatment and getting into the OR. Mobile and cloud-based systems can mitigate against these by keeping our experts involved in care when we most need them. Sharing clinical information is more important now than ever before and being able to coordinate it between experts is critical. Even on an organizational level, managing bed allocations and discharges is critical to continuous care. The cloud and mHealth are the answers. Saving money matters. In healthcare more than ever and all over the world. Whether using analytics to improve coding and billing, creating paperless systems or reducing litigation, the systems and platforms exist to do that. Many providers need to be more obvious about the cost-benefits of their systems, but providers also need to engage them more for their own benefit too. 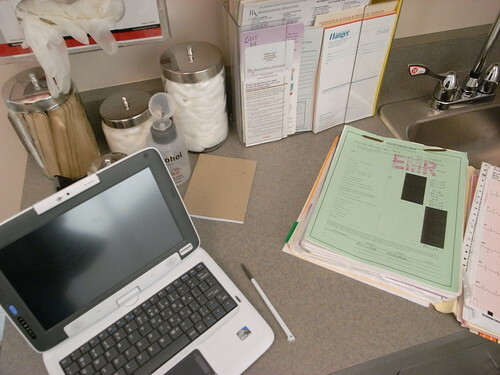 One company I recently worked with demonstrated a $350,000 savings just by eliminating the role of paper in a note taking process for a single department of a medium sized hospital. If that’s not a business case for digital health then I don’t know what is! Forget IT for a second. There are mountains of archived paperwork all over the world being left to rot. That’s all clinical and organizational data that we could be analyzing and using to support clinical and organizational decision making now! The trends, patterns and correlations could save time, money and more importantly, lives. Why aren’t we doing anything about this? Digital health can. Healthcare is divided into discrete events when it doesn’t have to be. It’s not just about when you’re in the doctor’s office once every couple of months. It’s what happens during the rest of the time that matters too. Remote monitoring and diagnostics are keeping healthcare professionals in the loop, but more importantly mobile health can keep patients communicating and managing themselves proactively. Communication is the cornerstone of healthcare and digital health can make it happen. So those are 5 reasons why providers, insurers, government and everyone else needs to be involved in and supporting the growth of digital health. I certainly hope you’ll join me in doing so! « Can Healthlier Compeitition Help Save Healthcare From Itself?